If you’re considering getting a small pet for your family, you should consider getting a guinea pig. These awesome little fur balls, called cavies, are adorable, gentle, and very friendly. Why do Guinea Pigs Make Great Pets? What Kinds of Accessories do Guinea Pigs Need? A guinea pig is a small, furry critter native to the Andes Mountains of South America. They belong to the Caviidae family. They are not pigs, but are technically rodents, and are actually estimated to be the first domesticated rodents kept for pets. Guinea pigs are great pocket pets. These small, furry creatures don’t take up a lot of room, yet bring a lot of pleasure and cuddle time for kids and adults. These little furries have been pets since the mid-16th Century when they were first imported to Europe as a novel creature. Unlike other small animals, guinea pigs are hardy. They can tough through a lot of things and don’t tend to get ill as often as other, more delicate species of rodents and small animals. Guinea pigs make great pets because they’re very gentle, easy to care for, do well with children, and both purr and pop up happily, with regular happy squeals to let you know they’re doing well and feeling happy. When you get a new guinea pig, you’re going to need some basic supplies. 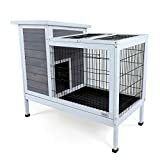 We found some of the top guinea pig cages for you to consider trying out for your new furry pal. Sue’s C and C Cages are actually a kit for building your own guinea pig cage to best suit your pal. You put together the components to create exactly the cage you need for keeping your cavy save and cozy. We love the flexibility of this cage. And if you happen to have dogs or cats in the home, the kit comes with instructions for how to put together a top to the cage. Otherwise, your guinea pig’s habitat is safe to leave with an open top. This awesome habitat for guinea pigs and other small pets is one of the top-rated cages on various sites. We’ve picked it for our list because we happen to agree that this home is awesome. The Midwest Critter Nation with Stand is a two story home for your cavy to climb up and down in, and explore through the various features you add. The sturdy ramps going between levels makes it easy for your guinea pig to get some exercise in his home, as well as safely navigate his entire space. There are two resting platforms, as well as the two solid bottom surfaces in the Midwest Critter Nation, which means your cavy has more levels than he’ll know what to do with. You can place extra hutches in there for him. Of course, the size of this cage also means you can have a couple of guinea pigs without issue. While the Kaytee is designed for rabbits, this home is perfect for guinea pigs. It comes with casters, meaning you can easily move it around, and every platform in this simple home has easy to climb ramps. Guinea pigs take quickly and easily to this home. The latches are chew-proof and the doors give easy access to pull out your cavy for playtime in his playpen. This is one of our all-time favorite small pet cages. The Living World Deluxe Habitat is perfect for small animals like guinea pigs, rabbits, rats, and chinchillas. We love the curved top, spill-proof food dish, and the easy-access balcony for your pets to crawl up onto. The Living World Deluxe Habitat is easily cleaned, has great ventilation, and is attractive, too. You really can’t beat it. 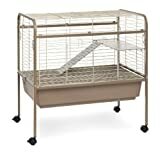 The Ferplast Guinea Pig Cage is another one of our favorite choices. This reasonably priced guinea pig home is perfect for a single cavy. The front of the cage opens entirely for easy retrieval and cleaning. There’s a built in hutch, and a built in hay feeder. The cage also comes with a food dish, and water bottle. This is a great starter home for a family new to owning guinea pigs. Of course, before you buy any cage, you should read reviews, and make sure that the cage you’re looking at will fit your needs. 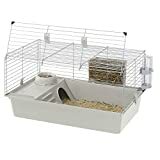 Take into consideration things like ease of cleaning, how easily your kids will be able to get the guinea pig out, and how much space the cage will take up.